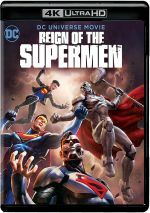 Reign of the Supermen appears in an aspect ratio of approximately 1.78:1 on this Blu-ray Disc. Because Reign came from the same crew who made Death of Superman, the visuals looked virtually identical. As such, I took the easy way out and reproduced my comments from the earlier review – why reinvent the wheel and all that? In terms of colors, Reign went with a fairly bright palette that could lean teal, but it also emphasized primary colors. The tones looked solid within those parameters. Another “echo” of the Death Blu-ray, the DTS-HD MA 5.1 soundtrack of Reign opened up the comic book material in an appropriate manner. The forward channels brought out the majority of the material, but the entire package added a lot to the movie. Music presented strong stereo imaging, while effects cropped up in logical spots and blended well. A few extras appear, and we get a Sneak Peek at Justice League Vs. The Fatal Five. It fills nine minutes, 29 seconds with notes from producer Bruce Timm, screenwriters Jim Krieg and Eric Carrasco, director Sam Liu, and voice director Wes Gleason. The disc opens with ads for Aquaman (2018) and Constantine: City of Demons. Trailers adds clips for Shazam and Death of Superman. 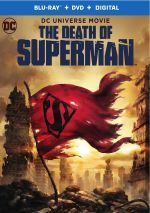 Though I wasn’t wild about The Death of Supermen, its second chapter fares better. 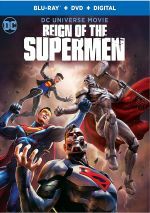 Reign of the Supermen offers an appealing mix of action, intrigue and comedy to become a solid adventure. The Blu-ray brings very good picture and audio along with a handful of bonus materials. Reign brings us an effective superhero tale.